Violetta Rand’s third installment in the Blind Series is available now on Amazon. This is by far my favorite in the series, and I gave it five out of five stars. True redemption is earned, not given . . . The past is something he’d sooner forget . . .
Aaron McNally hates his past. Banished for betrayal, he trades his tartan for a Norwegian title and sword to win back his honor. She has a warrior’s heart . . .
It’s difficult for Kara Dalgaard to act like a lady, even when her father demands it. After the handsome Jarl Aaron McNally arrives at her home recruiting for the king’s army, she’s forced to participate in a cruel deception to humiliate him. She quickly regrets what she’s done. However, duty comes before happiness. Aaron wants a second chance at life—and Kara is everything he’s dreamed of. But the past always has a way of catching up. Will Kara trust or condemn him to a life of loneliness? She’d felt uncomfortable around Aaron since the first time they met. Now, under his scrutiny, her insides squirmed with every sort of emotion she could possibly feel. Should she tell the whole truth? Disclose how she’d blindly set out to visit her kinswoman with the intention of finding him first? Or leave out that one detail? He sighed, releasing her. “Stand.” He helped her to her feet. “Like this?” He pointed at her breeches. A chill rushed through her body. His teasing tone made her unsure of herself. “Is something wrong?” Her gaze followed him. “Are you prepared to hear the truth, Kara?” he started. “I’ll give you the courtesy of honesty. First, this unsightly gusset on the back of your breeches …” His intrusive fingers flicked their way up her arse. “It’s unacceptable. And there’s a small hole here. And this …” He twirled her around. “Look how grimy the leather is. Is this dried blood on your thigh?” He caressed her leg. Amelia stepped forward, leather bag in hand. Her gaze traveled from Aaron to the thicket he’d indicated. “I’ll do as you ask.” Her maid gave her the satchel. A surge of excitement and fear overtook her. She’d prayed for time alone with him. Now that she had it, well, she wasn’t sure what to do. Aaron inspected the sky. “Aye, tis late,” he agreed. “Hurry.” He gave her a gentle push. Kara walked to the trees. What kind of pigheaded man thought about what a woman should wear in the middle of a fight? 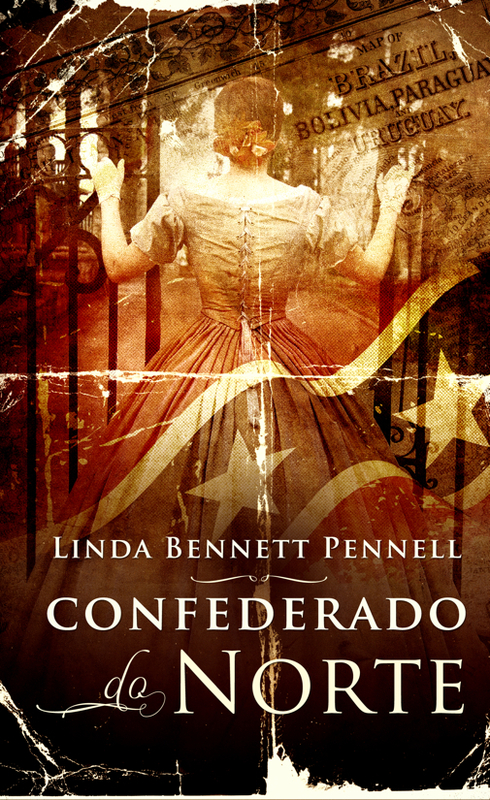 Mary Catherine is devastated when her family immigrates from Georgia to Brazil because her father and maternal uncle refuse to accept the terms of Reconstruction following the Confederacy’s defeat. Shortly after arrival in their new country, she is orphaned, leaving her in Uncle Nathan’s care. He hates Mary Catherine, blaming her for his sister’s death. She despises him because she believes Nathan murdered her father. When Mary Catherine discovers Nathan’s plan to be rid of her as well, she flees into the wilderness filled with jaguars and equally dangerous men. Finding refuge among kind peasants, she grows into a beauty, ultimately marrying the scion of a wealthy Portuguese family. Happiness and security seem assured until civil unrest brings armed marauders who have an inexplicable connection to Mary Catherine. Recreating herself has protected Mary Catherine in the past, but the latest crisis will demand all of the courage, intelligence, and creativity she possesses simply to survive. As often happens after such a night, I felt unable to rise at my usual hour and remained abed long after the maids cleared breakfast from the morning room. My daughter-in-law, bless her heart, meant well. I told her it was ridiculous to bring the doctor out on such a frigid day, but apparently the very old, like the very young, are not to be trusted in matters of judgment. After the doctor listened to my chest, a studied sympathy filled his eyes and he gently suggested that perhaps I should get my affairs in order. No doubt he wondered at my smile for he couldn’t have known I have no affairs other than my memories and the emotions they engender. Unlike most elderly persons, I don’t revel in slogging through the past. It isn’t wrapped in pretty ribbons or surrounded by a golden aura. Instead, its voices haunt my dreams, demanding and accusatory. Until recently, I’ve resisted their intrusion into my waking life, but I now believe the past can no longer remain buried in nocturnal visions. It must be brought out into the light of day. From its earliest moments onward, the past’s substance must be gouged out, pulled apart, and examined bit by bit until its truth is exposed. While total objectivity may not be possible, I have concluded that committing the past to paper is my best hope for sorting facts from imaginings. Perhaps then I will achieve the peace that has so long hidden its face from me. You see, when I was quite young—only a girl really—I killed four people. Two were dearly beloved, one was a hated enemy, and the last was a dangerous criminal. My story begins at the end of a terrible war, one that destroyed many lives and much property. But for that war and a handful of newspaper editorials and advertisements, my life would have turned out quite differently. Sometimes it seems no time at all has passed since I was a nine-year-old child standing on the deck of a ship watching home disappear over the horizon. Warm Gulf breezes tugged at the brim of my bonnet, setting its ribbons dancing. Leaning over the Alyssa Jane’s railing, I stared back in the direction of Mobile Bay and pretended I could see the dock where my beloved Bess stood, probably still waving. Mama, her pretty features marred by a furrowed brow and down turned mouth, paced beside me. Mama didn’t seem to understand anything anymore. Before we left home, she was calm and kind. Afterward, she snapped at the least little thing. I threw her a hateful glance, but she had already turned away, so I stubbornly leaned a little farther out over the railing. The wake trailing behind the Alyssa Jane looked like a blue-green path lined on either side by mounds of ginned cotton, a path pushing me away from the only life I had ever known. Only my sniveling broke the silence of that October morning. As I jumped through the open hatch leading below deck, the pungent odor of pine tar mixed with burning kerosene assailed my senses. I hated the smell. Besides making me slightly queasy, it reminded me of how final my losses were. Nothing at home smelled like the interior of that old tub. I hit the steps at a near run with plans to fling myself into my hammock and stay there forever. It would serve them right if I just upped and died. I bowled along toward the sleeping area blinded by tears and the sudden gloom of the narrow passageway. Without warning, I crashed headlong into a pair of wool-encased legs. The trousers’ owner and I struggled momentarily in an awkward dance. With a standoff in the making, he harrumphed once, picked me up by my arms, deposited me on the other side of him, and stepped toward the hatch. He gazed at me for a moment and then simply nodded before turning away. The Reverend Jonas Williams might be a man of God, but his unsmiling countenance raised the hair at the nape of my neck as though someone stepped on my grave. Mama often fussed that Bess planted too many of her superstitions in my fertile imagination. I was now old enough to understand that some of what Mama said was true. But the Reverend Brother Williams still affected me like a haint. A slight shudder slithered down my spine, as though my body was trying to rid itself of his effect. I turned and fled down the hallway toward our sleeping quarters. Many months later, I would come to see this encounter as an omen, a foreshadowing of all that came afterward. I slumped on the edge of my hammock and kicked at the floorboards, allowing tears to drip from my chin unabated. Life wasn’t at all how it was supposed to be. It hadn’t been since the day Papa rode away to war. He looked so handsome in his gray captain’s uniform. He sat on his favorite stallion at the head of his unit and rode toward a conflict that everybody said would be over by Christmas. Everybody had been terribly wrong. My ruminations, while sad and haunted, didn’t last long, for my mind turned to more immediate indignities and irritations. I hated staying below deck. I hated the stench. I hated the isolation. I hated the boredom. When I figured enough time had elapsed that it was safe to go above again, I bolted back into the fresh air. Mama now leaned on the stern railing, her gaze fixed on the faint line where the sky’s lighter blue met the Gulf of Mexico’s deep azure. She sniffed once as I approached and turned unusually bright eyes on me. Only when he stopped speaking did I notice tears streamed down my cheeks. Papa got a far off look in his eyes. His hands released me and dropped to his side as he straightened to his full height. Home. The way it used to be before Papa and Nathan decided they would not endure Yankees and carpetbaggers, our former enemies, being in charge of everything. I was only five when the War Between the States began. Our old way of life now seemed like a gauzy dream—pleasant upon waking, but dissipating when you reached out to grasp it. Afraid of losing the last tenuous hold on that dream, I invented a little ritual, hoping it would glue fading images to the pages of my memory. Now that Papa and my mother’s only surviving brother were dragging us away from Georgia never to return, the ritual’s importance had taken on the stature of an obsession. I closed my eyes and once again conjured up my earliest memories. In my mind’s eye, I looked down on the Oconee River from the deep porch of an unpainted dogtrot farmhouse. Cotton fields that came right up to the house stretched out as far as I could see in every direction on our side of the river. The house and the farm wouldn’t have been terribly grand by most people’s lights, but it was home and, therefore, my whole world. The clapboard house and outbuildings existed only in shadowy visions after the war. While I retained only a few hazy memories of the farm, one stands out clearly. It is of Mama’s favorite rose bush to which I did some considerable damage one spring by picking off all the buds before they even broke color and for which I received the first spanking of my life. My clearest memories of my parents before the war were that Papa spent his days with the field hands and that Mama loved music. Beautiful music filled the house when she played her pianoforte. Sometimes when Bess brought me into the parlor to say goodnight, Papa would be sitting beside Mama, kissing her neck as she played and she would be smiling at him in the special way she reserved only for him. I think they must have been very happy. They laughed a lot back then. Then, the war came. Nobody and nothing was ever the same again. Papa had come back from the war haunted by what he had seen and the losses he had endured. For a time, we thought he had permanently lost his mind. These days, it didn’t take much to rile him. Mama said not to mind, that he just had so many worries it made him harder to live with than before. Even so, I still couldn’t understand why he spoke so cruelly about Bess of whom he’d always been so fond. My papa’s sunny nature was the most important thing destroyed by the war. As the days under sail passed into weeks and America became nothing but a memory, Papa’s disposition evolved. To everyone’s relief he seemed more like his old prewar self. The farther we traveled, the more his mood lifted so by the time we docked in Jamaica to take on supplies, his good days outnumbered the bad. I even saw him and Mama kissing under the stars one night when they thought no one else was on deck. Instant compliance and a sweet smile seemed to go a long way these days, so I did as I was told. I didn’t want this new/old version of my papa to disappear again. We passed through Kingston Harbor’s narrow mouth with sails snapping, pushed along by Caribbean breezes. In the distance, I could make out the familiar marks of human habitation trailing along the waterfront, but nothing in my experience had prepared me for Jamaica. Low emerald mountains surrounded an oval bowl of aquamarine water that rolled gently forward to kiss sand the color of cotton just breaking from the bole. Within minutes of entering the harbor, the city’s buildings became distinct and grew in size. A little thrill swept through me as the old clipper bumped against the dock and the sights and smells of Kingston spread out before us like a feast awaiting revelers. Papa smiled and picked me up, swinging me around like he used to when I was little. When he placed me on the deck again, I pressed my advantage.